The Ultimate Halloween in Arizona! Are you ready for Halloween? Across Arizona, the welcoming of October means a month-long preparation for All Hallows’ Eve. To get you in the spirit of this spooky holiday, it’s time to get creative. Visit a candy store and stock up, check out a field of screams, or take a real haunted tour. Here’s how to have the ultimate Halloween in Arizona. No Halloween is complete without candy. In order to celebrate properly, however, you need to load up right. That’s where Sweeties Candy of Arizona comes in. This family-run candy emporium holds the title of the largest candy store in Arizona. It doesn’t disappoint. This Chandler shop is filled to the brim with all of your favorite classic candies available pre-packaged or in bulk. This 13,000-square-foot candy land goes through 100,000 pounds of candy each day so be sure to prepare your sweet tooth. Have you seen “Children of the Corn?” Then you might be inclined to skip out on this haunted house. Field of Screams is a haunted cornfield that is planted over an old cemetery. If you are bold enough to make the trip, you’ll be sure to encounter danger at every turn. No trip to Field of Screams is without a few blood-curdling encounters with the living dead. The outdoor haunted attraction isn’t recommended for children of the faint of heart. Proceed with caution. Of course, Halloween isn’t all about getting spooky. It’s also about partying it up and showing off your best costume. 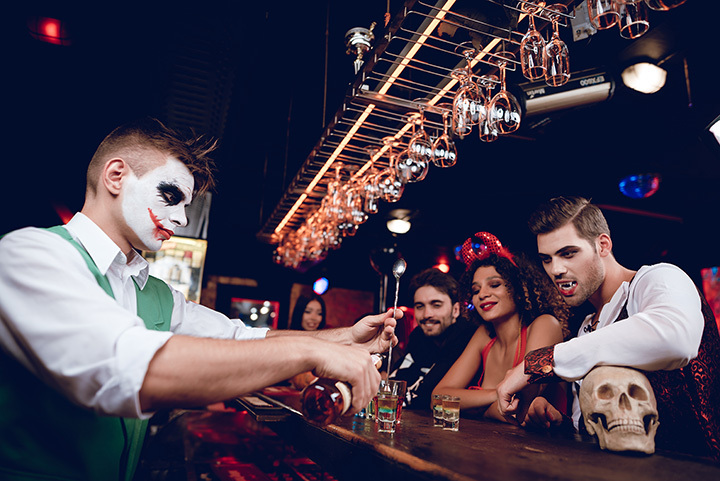 There’s no better place to party on Halloween than the Saguaro Scottsdale. It’s home to the annual Haunted Hotel Ball, a three day bender that celebrates all things Halloween. Thousands attend each year to try their hand at winning the Valley’s best costume contest, complete with a multi-thousand dollar reward. It’s also home to A-list DJ’s and an all out dance party you won’t soon forget. You can also wash away the hangover at their Detox Pool Party, which features local breweries and DJ’s. Forget about trick-or-treating in your neighborhood. You can take your kids to the Salt River Fields Balloon Festival instead. This annual event is the Valley’s best Halloween festival. Kids can trick-or-treat around the festival, which hands out over 4,000 pounds of candy every year. It’s also home to over 20 tethered hot air balloons, live music, food and beverage vendors, and fireworks displays. This two-day spooktacular is a must-see event for Valley families. There’s no shortage of costume shops in Arizona. But none quite compare to Easley’s Fun Shop. This downtown Phoenix staple has been spookifying Valley residents since first opening 70 years ago. Though it started as a small magic shop, it’s grown to encompass 15,000 square-feet of the best selection of costumes in Arizona. It has everything you need from wigs, makeup, accessories and of course, retail costumes. Not looking to buy? They have plenty of rentals available at their epic storefront. Looking for an authentic haunted attraction? You don’t have to head to Transylvania. Instead, take a trip to the Vulture Mine in Wickenburg. It was once the sight of a bustling gold mining industry in the late nineteenth century. Today, the gold mine has long since been abandoned, save for a few supernatural creatures. Rumor has it the Vulture Mine is still haunted by angry spirits that were victims of the infamous “Hanging Tree.” See for yourself just what goes on after dark—if you dare. What better place to do some ghost hunting than an actual ghost town? Jerome, Arizona was once a bustling town that was home to a rich copper mine. Its population exceeded 20,000 back in the 1920s. The self-proclaimed “Largest Ghost Town in America” is now only home to a few hundred people…and ghosts. Your guided tour will take you on a two-hour ghost hunt through some of Jerome’s most haunted buildings. Your flashlight is your only source of light as you wander deep into abandoned buildings, murder sites, and mines.